Transmission issues can be among the most serious and hardest to diagnose and repair. However, AAMCO of Ypsilanti and Ann Arbor, MI, takes the time to thoroughly diagnose all transmission problems before developing the effective plans for their repair. While your engine is essential, transmission issues are among the most severe and dangerous aspects to take care of on your car immediately. Thanks to our exclusive multi-point transmission scan service, we’re able to pinpoint the exact cause of your transmission issue. If you are noticing gears slipping, strange sounds coming from under your hood, burning smells, grinding noises, or leaking fluid, you may have an issue with your transmission. Bring it in today to let our expert technicians take a look. A full transmission check can take about 90 minutes. Using a sophisticated computer system scanner, our technicians are able to retrieve possible trouble codes, check all critical systems and compare your system’s data with the data found in our extensive technical database. We’ll also take your vehicle for a short but effective test drive to better understand and gauge its initial engagements, drive range, upshifting and downshifting timing and quality, passing gears, TCC engagement, and more. Our technicians will also test your vehicle in neutral, park-hold and reverse, feeling for vibrations and listening for unusual noises, before placing your vehicle on a lift for us to inspect and evaluate all of the external components. 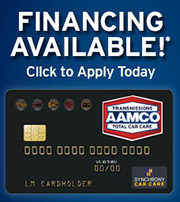 Because newer vehicles are especially dependent upon their computer systems, AAMCO of Ypsilanti and Ann Arbor, MI, provides advanced computer and internal diagnostics when determining the exact cause of transmission issues, so you’re never charged for any unnecessary repairs. Using a sophisticated computer system scanner, our technicians are able to retrieve potential trouble codes, check all critical systems and compare your system’s data with the data found in our extensive technical database. Call today to schedule an appointment for state-of-the-art diagnostics that help you get back on the road quicker and more cost-effectively.